Romanian capital is probably one of the best cities to live in this time of year. All the great fun from the summer time but no heat. At Enea, there’s probably one thing that we love as much as we love coding and that is sport. We’ve shown it every year through our various competitions we’ve been organizing. And we’ve also had some really good opportunities to promote this right here, on our blog. We talked about Lucian’s triathlon experience, Mihai’s Wimbledon passion and we’re preparing for some new incredible stories. Speaking of incredible opportunities, there’s one happening this October in beautiful Bucharest, the Bucharest International Marathon, one the most commendable events of this type, which has already reached its fifth edition. For those of you who are starting to think it would be maybe too much, don’t worry! It has three sections where you can compete, featuring a classic 42 kilometers track, a half circuit which is 21 kilometers long, and a popular race, which extends around the Parliament Palace on a distance of a few kilometers. If you’re still wondering why you should participate in this marathon, we have some answers for you. First of all, there’s nothing like the feeling of joy and freedom that comes with running. Along with the health benefits associated with exercising, there’s a feeling of a small victory in knowing that you managed to overcome your limits. Oh, and there’s also the glory. The Greeks did it first, and their memory lasted for millenia. 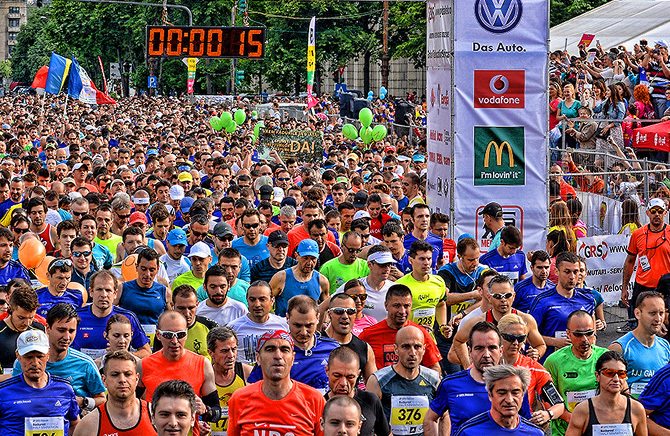 Secondly, we’ll have you covered for the entire event with state of the art running equipment which includes an electronic chip for time recording, access to all refreshing points that include water, energy drinks and wet sponges, medical assistance – just to be safe – and best possible conditions for running on a street in Bucharest. Oh, and did we mention that we’ll give you a medal as well, no matter the place you finish on? That’s right, eternal joy fitted for a trophy-wall in your home. We like to think that by now we have convinced you. But nonetheless, you should hurry. Registrations are permitted up until 20th of September, and we can do that for you if just speak to our wonderful Alexandra from HR. Don’t forget to mention your telephone number and t-shirt size.